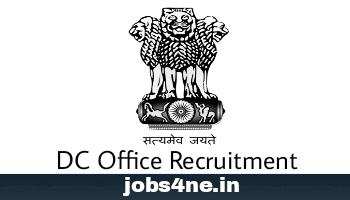 DC Office, Karimganj Recruitment 2017- Librarian, Jr. Asstt., Grade IV, Bearer, Chowkidar Posts in PDUAM: Last Date 24-05-2017. - Jobs4NE : Jobs in Assam and North East India. DC Office, Karimganj Recruitment 2017- Librarian, Jr. Asstt., Grade IV, Bearer, Chowkidar Posts in PDUAM: Last Date 24-05-2017. Deputy Commissioner, Karimganj District in the capacity of Chairman of Governing Body of Pandit Deen Dayal Upadhyaya Ardasha Mahavidylaya at Eraligool, Dist: Karimganj invites application from Indian Nationals having proficiency in local language for the post of Asstt. Librarian/ Jr. Asstt./ Grade IV/ Lab. Bearer/ Lib Bearer/ Chowkidar as detailed below. Eligible candidate may submit application within stipulated date. Last date of receipt of Application: 24-05-2017 till 05 pm. Total no. of posts: 19 Nos. 1. Asstt. Librarian: 1 (UR). 2. Jr. Asstt. : 2 (UR), 1 (OBC/MOBC). 3. Gr. IV: 2 (UR), 1 (OBC/MOBC), 1 (STP). 4. Lib Bearer: 1 (UR). 5. Lab Bearer: 3 (UR), 2 (OBC/MOBC), 1 (SC), 1 (STP), 1 (STH). 6. Chowkidar: 1 (UR), 1 (OBC/MOBC). Age Limit: Age of the candidate should not be more than 43 years as on 01.01.2017. 05 (five) year relaxation for SC/ ST candidates. 1. Asstt. Librarian: Bachelor of Lib. Science from any recognised University. 2. Junior Asstt: Graduate in Arts/Science/Commerce from any recognised University with knowledge of Computer typing and simple excel, diploma /Certificate of Computer knowledge for minimum 3 (three) months duration. 3. Lib. Bearer: HSLC passed from any recognized Board. 4. Lab Bearer: HSLC Passed from any recognized Board. 5. Grade IV: HSLC passed from any recongnized Board. 6. Chowkidar: HSLC passed from any recognized Board. 6. Chowkidar : Rs. 4560-15000/- + GP Rs. 1500/-. Application Fee: Rs. 100/- tobe deposited in the form of Demand Draft in name of Deputy Commissioner, Karimganj District. How to apply: Application in Standard Form in Assam Gazette No.-IX to be delivered in the Deputy Commissioner, Karimganj, Application to be submitted to the office of the Deputy Commissioner. (Dev. Branch) Karimganj on or before 24.05.2017.